Ideal for serious Orthopedic, Musculoskeletal, Vascular, and OBGYN Ultrasound. M-Mode, B-Mode, and Color PW Doppler. 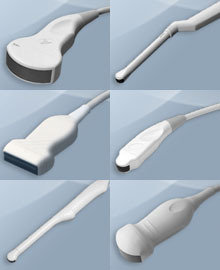 Wide range of available multi-frequency probes, including the powerful L5-12ED-N linear probe for thyroid, small parts, musculoskeletal, orthopedic, and vascular ultrasound exams (with a range of 5 - 12 MHz). The Sonoace PICO is ideal for those doctors who wish to have an advanced portable color Doppler ultrasound at an affordable price. We are positioned to be able to provide these systems NEW for what other portable color Doppler systems sell for used at 3 to 4 years. Try us! Call us now at 800-839-0722. We can answer your questions and help you make the best choice of a new ultrasound for your practice. 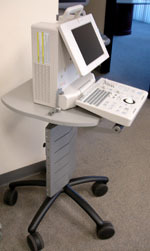 SONOACE digital color ultrasound systems have a reputation for delivering quality imaging at value prices. And now we have shrunk that imaging power down into a rugged, briefcase-size package that delivers virtually all the diagnostic capabilities of a conventional cart-based system anywhere there is a power outlet. 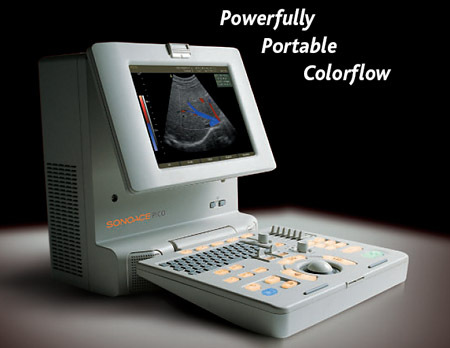 Welcome to the SONOACE PICO, the value choice in portable color Doppler ultrasound. The SONOACE PICO is a full-featured digital color ultrasound system with virtually all the imaging capabilities you would expect from a cart-based system with the added benefit of being fully portable. Built on a reliable Linux PC platform, the SONOACE PICO boasts all- digital beamforming and signal processing for best-in-class image resolution enhanced by a long list of advanced diagnostic tools such as harmonic imaging, color and power Doppler, and freehand 3D imaging. 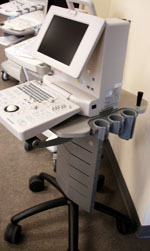 A full-featured portable digital color ultrasound system SONOACE PICO is also available specially configured with a lightweight five-wheel rotating cart. The new cart is ergonomically designed and enhances convenient mobility in your busy office. 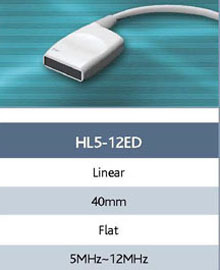 Choose from a wide array of available probes and frequency ranges: from microconvex to wide-angle convex abdominal probes, from urological to transvaginal, and a number of linear probes of varying frequency ranges (including the new HL5-12ED linear 5-12 MHz musculoskeletal / vascular probe). The more information you include, the better we are able to recommend the ideal ultrasound package for you. Are you interested in peripheral vascular ultrasound? 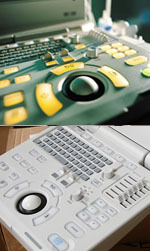 Do you have any experience or ultrasound training? How soon would you like to be up and running with ultrasound? Do you have an approximate budget or monthly payment you would like to keep within? Fill out this short form and we will send you information on the PICO. Keep in mind, vascular Doppler ultrasound comes in several varieties ... and they are not created equal. 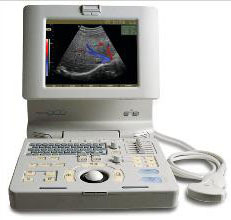 This PICO system, with its color PW Doppler, is capable of everything from basic vascular and cardiac exams on up through extremely intricate vascular calculations that only a trained sonographer can really navigate. While you do not need Doppler at all in order to place PICC lines, you do need color Doppler to watch blood flowing (in blue and in red) and to make calculations based on it.